Srinagar, July 10, (Scoop News)-Governor N.N. Vohra, undertook a road journey between Poonch and Shopian on the Mughal Road today afternoon to gain a firsthand assessment about the maintenance of this prestigious road link between Rajouri- Poonch area and Kashmir Valley. Earlier in the day, the Governor interacted with Legislators of Poonch District and chaired a meeting with State, Divisional and District level officers to take stock of various ongoing development projects in the district. After the Review Meeting, the Governor was scheduled to fly back to Srinagar. However, on being informed that he could not do so because of inclement weather conditions over the Pir Panjal range, the Governor decided to return to the Valley by the Mughal Road. Advisor to the Governor, Shri B.B Vyas, Principal Secretary, Planning and Development, Shri Rohit Kansal, Divisional Commissioner Jammu Shri Sanjeev Verma, DIG Poonch, Deputy Commissioner Poonch and SSP Poonch accompanied Governor up to Peer ki Gali where Chief Engineer Mughal Road project gave a presentation about the maintenance of the Mughal Road project. Governor also interacted with the local people along the road and certain visiting tourists and passengers at Peer ki Gali to know their experience of travelling on this road. Governor took serious note of the poor maintenance of the Mughal Road and directed the Public Works Department (PWD) to under -take a comprehensive Audit of Maintenance Expenditure in the past 3 years. He also sought an immediate report for the failure of repair and maintenance works. Governor, interalia, directed that the Chief Engineer Mughal Road Project shall undertake a comprehensive Safety Audit of the Road and take all corrective steps to immediately repair the critical stretches on the Road to ensure full safety of all those who travel on this road. In response to the suggestions made by passengers, Governor ordered the construction of five Public Toilets along the Road and, besides, Resting Sheds for shelter. He also directed that the required repairs of the Langar/Sarai building at Peer ki Gali should be urgently carried out in consultation with the Forest Department and a report sent to him. 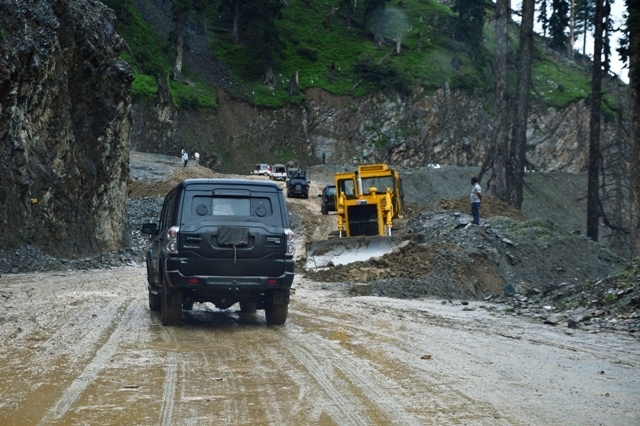 This was the first ground reconnaissance of the Mughal Road by the Governor.